Preheat oven to 450° F. Brush pizza crust with olive oil, thyme and black pepper. Bake in oven for 8 – 10 minutes or until golden brown. While pizza is baking, heat apple cider and white wine in a medium pot on the stove. Gradually add shredded Velveeta® until melted, then gradually add the shredded Cheddar cheese. Add the dry mustard and nutmeg and stir well. Poor into a fondue pot. 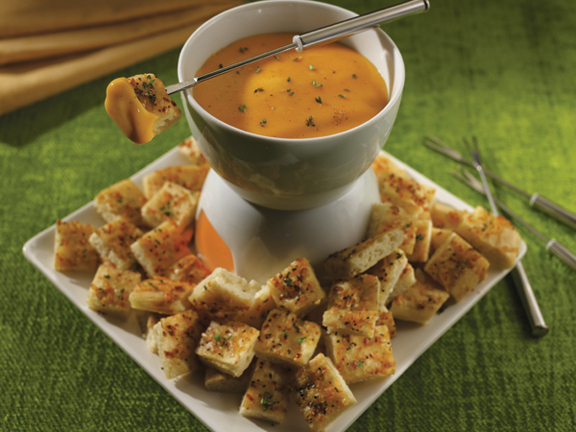 Cut baked pizza crust in to bite-sized pieces and serve alongside the fondue for dipping.